The UCM/Heatmiser allows the integration of Heatmiser thermostats, both RS485 and wifi types, with the Comfort integrated Intruder Alarm/Home Automation System. allows control and temperature monitoring of Heatmiser thermostats from keypads, telephone, iPad/iPhone/Android app, SMS (with UCM/GSM), or software. allows control of Heatmiser thermostats by Time Programs. allows setting of the alarm to Away, Night, Day, Vacation and Security Off to change heating and cooling setpoints in Heatmiser. The UCM/Heatmiser with Isolated Rs485 interface is shown below. In Comfigurator 3.7.8, go to Options > Settings > UCM Connections and select Network (Local). Click on the link for Comfort Server Manager. When the ETH03 is connected in the same physical network then Comfort Server Manager will automatically discover it. Ensure the Version has the word HM (for Heatmiser) i.e. Eth3HM-v1.04 for the current release. The ETH03 firmware for Heatmiser can be downloaded from http://www.cytech.biz/eth03_firmware.html Download ETH03-heatmiser.zip and unzip to a hex file. 'Clear List' button clears the display on the Comfort Server Manager screen. 'Reboot' button reinitialises the ETH03 module. By default the ETH03 is set as DHCP enabled. Uncheck the DHCP checkbox and enter the new IP and Gateway fields to assign a fixed IP address for the ETH03 module. Press the 'Submit' button to confirm. The UCM/Heatmiser supports integration for up to 32 thermostats, 32 humidity/temperature sensors, and an outside temperature sensor (for RS485). Up to 8 wifi thermostats can be supported by UCM/Heatmiser with ETH03. 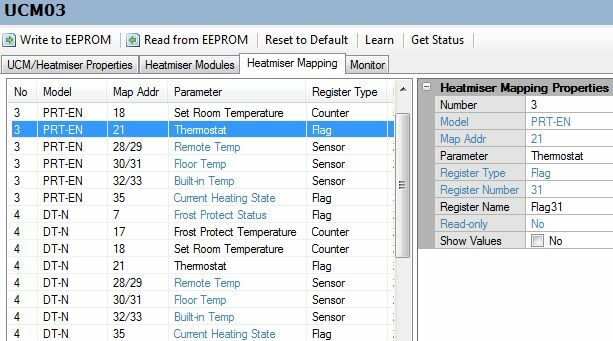 Comfort can be configured to control and monitor certain parameters of Heatmiser thermostats by first mapping them to Comfort's Register (Counter, Flag or Sensor). Temperature is mapped to Comfort Sensors (0 to 31 in Ultra). Sensor values can be assigned as status feedback for Control Menu so that they can be heard on the keypad or phone or seen via the Comfort iPad/iPhone/Android Apps. A Comfort sensor can be mapped to only 1 Heatmiser temperature sensor to avoid conflict of values. Changing the Comfort sensor value will not have any effect on Heatmiser temperature reading. Thermostat On/Off states are mapped to Comfort Flags (1 to 255). Flags can be assigned as status feedback for Control Menu so that they can be heard on the keypad or phone or seen via the Comfort iPad/iPhone/Android Apps. A flag can be mapped to only 1 Heatmiser state to avoid any conflict of values. Changing the value of the Comfort Flag will also change the state on the mapped Heatmiser State. Does anyone have any experience with interfacing wifi thermostats with UCM/Heatmiser? Is the UCM/Heatmiser (RS485) compatible with the Heatmiser v2 protocol - the PRT-EN units? Not suree what is the diference with V2. Could you tell me a little more about what this ucm lets you do with heatmeiser - ie can you do the same as if you were using their programmable thermostats? I have a heatmeiser system with 4 stats and wiring centre. For example, can I control all 4 via comfort? If so, is it done through the control menu? Ie whether using phone, app or keypad, you go to control menu? Can you for example do temperature up and down? Can you do hot water boost? Trying to work out if it’s better just to get their control centre so I can control everything from one point. They changed their protocol with the newer products so it is diffciult for 3rd party systems to keep up. Has anyone tried the heatmiser v2 touchscreen thermostats ? I see that they have a modbus interface but the manual doesn't say what can be commanded or queried. If I were to pair this with a modbus UCM could i control it from comfort ? And if so, how might I control it using the comfort app ? John.Ps sorry I thought I had created a new thread but now see it has gone on this pinned thread. OK, thanks. I will contact heatmiser for details. Just a little confused. You say - The wifi thermostats have been discontinued and are replaced by models which are not compatible with comfort. Yet the manual still refers to the wifi and having the sub module option for ETH03. Also the ETH03 sub module is still referenced as an accessory for the UCM/Heatmiser on the the Cytec web site. Am I right in thinking all of the references to WiFi are no longer relevant to UCM/Heatmiser and that only RS485 connections are possible? I might be wrong here, but I think the previous WiFi controllable variants aren't available now. Heatmiser now need you to have a neohub to control from their app, or use modbus. I've not figured out any other way, but I am no expert, just trying to update ours too. We will have to amend the manual.